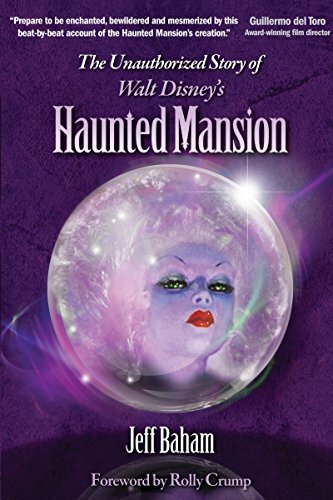 Join your new Ghost Host, Haunted Mansion expert Jeff Baham, for the definitive history of Disney's spookiest attraction. Sprinkled with photos, Baham's book contains everything there is to know about the Mansion, with never-before-told stories and comprehensive coverage of the Haunted Mansion's colorful past and its chilling presence at Disneyland, Walt Disney World, and other Disney theme parks. Beginning with the Haunted Mansion's original (but never realized) incarnation as "Bloodmere Manor", Baham pulls back the shroud on the clever effects that haunt the Mansion, including Ken Anderson's plan for a cyclorama-enhanced Headless Horseman, Yale Gracey and Rolly Crump's creative wizardry and "happy accidents", Bob Gurr's Doom Buggies, the technology behind Madame Leota's crystal ball, and the controlled chaos of the Ballroom Scene. You'll learn why X. Atencio's idea for a raven narrator was ditched in favor of the now infamous Ghost Host, whether a screaming man caught in a spider web once dwelt in the Mansion, and how technology exorcised the Hatbox Ghost. There's more to the Mansion than mere mechanics. More than perhaps any other Disney attraction, the Haunted Mansion is powered by story: the scenes and spirits you witness from your Doom Buggy all play roles in the overall narrative of the Mansion, and if you don't know the story, you'll miss out on a lot of the fun, and a few of the scares, too. There's always room for one more, and this time you're it: come experience the Haunted Mansion with the "lights on" and learn its ghostly history, its sinister secrets, and why this Disney attraction continues to happily haunt fans young and old. Cory Doctorow [BoingBoing.net]: Baham is one of the most trusted, established experts on the Haunted Mansion, a trufan’s trufan. Guillermo del Toro [Award-winning film director, co-creator The Strain]: Having delved into Disney lore for decades and having been immersed in the Haunted Mansion world since age 3, I thought I knew pretty much everything there is about my favorite Disneyland ride ever. I was wrong. Prepare to be enchanted, bewildered and mesmerized by this beat-by-beat account of the Haunted Mansion’s creation. A haunted tour that is both scholarly and thrilling. An “E” ticket ride to the darkest, most glorious regions of Disney’s imagination!